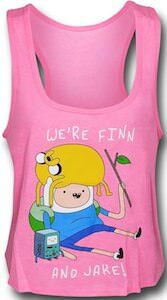 Are you going to an Adventure Time theme party, clubbing or just going or just hanging out and you need of a fun dress to wear. Well, look no more because this Adventure Time skater dress would look so cute on you and it could even match the theme of the party. 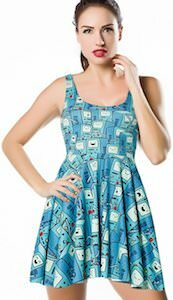 This blue Adventure Time mini dress features the cute BMO multiple times covering the dress from front to back. It has a tank type style top and a flare style bottom. Have a fun night out and be unique when you go out in this really cute Adventure Time BMO Skater Dress.